The singularity and latitude of the summons drew together, from all parts of New England and also from the Middle States, men of every shade of opinion from the straitest orthodoxy to the wildest heresy, and many persons whose church was a church of one member only. A great variety of dialect and of costume was noticed; a great deal of confusion, eccentricity, and freak appeared, as well as of zeal and enthusiasm. If the assembly was disorderly, it was picturesque. Madmen, madwomen, men with beards, Dunkers, Muggletonians, Come-outers, Groaners, Agrarians, Seventh-day-Baptists, Quakers, Abolitionists, Calvinists, Unitarians and Philosophers, all came successively to the top, and seized their moment, if not their hour, wherein to chide, or pray, or preach, or protest. 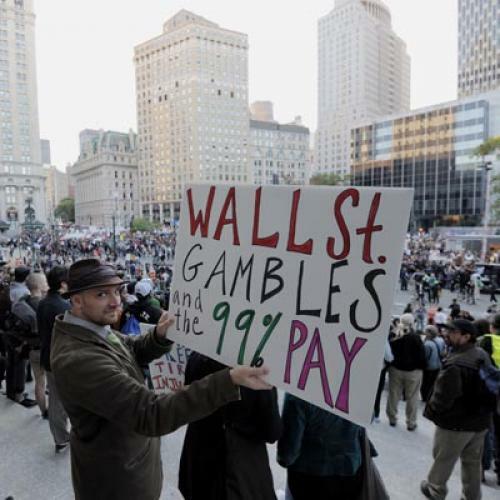 Has Slavoj Zizek given a speech at Occupy Wall Street? So have many others. The Chardon Street Muggletonians were a seventeenth-century dissenting sect who had lived on to 1840, and they had their oddities. But the Chardon Street abolitionists—hey, those people were right. And something is right at Occupy Wall Street. It is a carnival which is also more than a carnival. The demonstrators are chiding, and some of them are praying (religious Jews were observing Sukkot when I happened to pass by), and some are preaching, and everyone is protesting. Some of the participants are more modest and circumspect than may be supposed. I asked an Occupy Wall Street medic about the anarcho-syndicalist iconography of the medics’ Red-and-Black Cross station, and her answers were wonderfully lucid. I am sorry that I failed to take down her name, but I am glad to report what she said. She told me that, in her group of medics, the participants knew very well that red and black were the colors of the anarcho-syndicalists from the Spanish Civil War. And the colors seemed to her appropriate. The simple color red, she explained, might be problematic. The Occupy Wall Street medics are not the Red Cross, after all. Also, the color red might suggest communism, and the medics were not communists. The anarchism of the Spanish Civil War appealed to her though. It was because the demonstrations themselves are organized anarchistically, without much structure and without hierarchy. My medic-informant nonetheless expressed satisfaction that Spain’s anarcho-syndicalism of the past is a movement whose day came and went long ago. A gesture to the anarchists of yore did not signify anarcho-syndicalist fantasies in the present. She understood the playfulness at Occupy Wall Street, and this seemed to me splendid in every respect. Yes, yes, at Occupy Wall Street the madmen, the madwomen, the Groaners and the neo-Muggletonians will eventually have their day, and the movement will be ruined. Already the Maoists of the Revolutionary Communist Party are at work, together with Ron-Paul-ists, according to another of my informants. Visiting the demonstration on Thursday I noticed that the Workers World Party (which secretly controlled some of the big anti-Iraq War demonstrations, in the name of advancing the cause of North Korea) was already in evidence. The costumed neo-hippies and neo-anarchists will prove to be no match to the fanatics of Leninist discipline. Sooner or later the screw-ball groupuscules will wreck the whole thing. “Creative destruction” is originally Bakunin’s phrase, but the destructiveness of the Revolutionary Communist Party will not be creative. So the movement will stumble and fall, and a lot of young people will feel a little embittered and distraught. Anyway, the demonstrations, in their anarchist spirit, leave room for other people, more sensible or more sophisticated or, at least, more elderly, to put the protests in a properly institutional form. Last week I marched with the trade unions in support of Occupy Wall Street. The unions may not always be right, but they were not in fantasy’s grip. They were expressing the grievances of people with ordinary jobs, which is, in fact, the right thing to do. My particular delegation was the Jewish Labor Committee. The New Republic editorial worries about a danger to liberalism. The Jewish Labor Committee poses not the slightest danger to liberalism. On the contrary! So there is much that is good in Occupy Wall Street. Not every merry and angry rebellion is a fearful event. And when the festival has reached its end, and the time has come to shrug and turn away, perhaps because the Muggletonians or the Maoists have conspired to seize power in the demonstration’s general assembly, or because men with beards are delivering Castro-like orations, or some other such headache is taking place—well, no one with a sense of the past will be surprised. That day will come. But not yet! Meanwhile there are realities to proclaim and feelings to vent. Occupy Wall Street and its sleeping-bag neo-hippies and its costumed street thespians and the touchingly hand-written placards and generally the display of eccentricity and impudence have focused America’s attention for a fleeting moment on economic wrongs and inequalities. How wonderful!